Where did the term “Software Engineering” originate? Just in case you thought it was fairly new, it’s probably(*) older than you. Here’s a deep link, to a down-the-rabbit-hole discussion. Seems most sources attribute a 1968 conference, while the author of this message from the Software Craftsmanship group has dug up an ACM article from 1966. My background is not in Computer Science. (My background is in Engineering; More in About.) I happily stumbled, more or less backwards, into network and systems administration. Although I’ve always had the analytic and scientific skills for this work, I’ve had little education, formal or otherwise, on the theoretical side. Recently I was delighted to find a survey-level CS column in the Communications of the ACM. Reading CS classics widens your perspective by introducing stable, timeless ideas. You escape the popular themes of your times and evaluate the field from a more literal position. You learn about the qualities that make a person a great scientist. You realize those people are delighted to think over problems. By learning the history of computers and studying the lives and works of eminent computer scientists we all recognize the true merit of being part of such a respectful profession and privileged community. I dutifully queued the reference list for assimilation, and eventually I arrived at the following. If you’re a dyed-in-the-wool computer scientist, you surely see where this is going, and I encourage you to start laughing at me at this point. I propose to consider the question, ‘ Can machines think ? 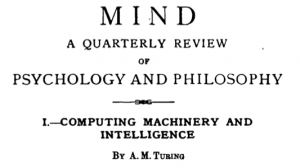 ‘ This should begin with definitions of the meaning of the terms ‘machine’ and ‘think’. … Instead of attempting such a definition I shall replace the question by another, which is closely related to it and is expressed in relatively unambiguous words. The new form of the problem can be described in terms of a game which we call the ‘imitation game’. I had to hand type a URL to figure out that “MIND” is a “quarterly review of psychology and philosophy”, and “LIX” was the volume number. This quoted article being from volume 59, issue number 236, circa October 1950. That’s a tri-axel dump-truck load of awesome in one citation.